So much of what we experience as digital is intangible. The color and texture of the Internet exists only for the time we have that particular site loaded. With just a click of the mouse, the lushness disappears. Except that it doesn’t, really. Backstage, every email, photo, YouTube video and document we share lives in a very real place, which is weird when you think about it. These massive data centers are like vaults of ones and zeros, some of which could wreak havoc in the wrong hands but, honestly, most of which will never mean anything again to anybody. Every time anyone uses a Google product, for example, like conducting a search or looking up directions, their computer talks to one of the world’s most powerful server networks, which are housed in huge data centers. 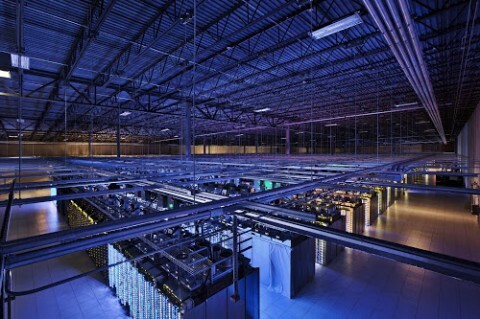 Very few people actually get to see where Google’s servers live. These data centers are high security, for good reason. The company recently launched Where the Internet Lives, part of a mini campaign to pull back the curtain on how the web works. They hired a photographer to capture eight of their data centers on, well, not really film, but you get the picture. Oh, and the data centers aren’t brick and mortar either. More like glass and drywall and pipes. Lots and lots of pipes. And like Willie Wonka and his famous factory, Google invited Wired magazine reporter Stephen Levy to visit and write a story about the previously off-limits facilities. Take a street view tour of the North Carolina data center (and see their "security team" at work). Photographer Connie Zhou's images are lovely and the facilities are beautiful in an eerie, futuristic way. See how water is used to keep the processors cool, where data is backed up, failed drives destroyed to keep data safe and how workers get around. Google employees get a fair amount of play, with shots of them working to build, maintain and repair the machines. It’s a peek behind the scenes, but it’s also marketing. And what’s interesting is that it’s a lot like the automobile industry’s marketing (think of Saturn’s ads in praise of the assembly-line worker) and campaigns by the Big Three to attract auto workers in the 1940s. Some of the photo captions recall the nostalgic, Utopian messaging of the post-War era, when efficient, modern suburban communities were sprouting up around industrial centers. This lunch room looks pretty nice, and the sauna is right outside.